If you like getting up to no good, this nail polish from Illamasaqua, called Boosh, will help you gloss over the evidence. So hard wearing and chip resistant, you could crawl your way through a graveyard and still maintain the perfect manicure. Just set it, forget it, and do whatever delights you. 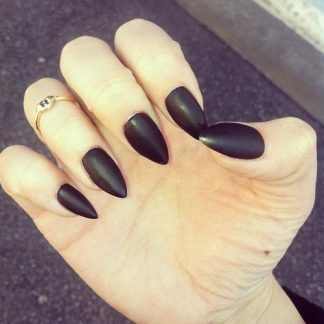 If you’ve been a bit overzealous in the chewing department lately, or maybe you just can’t grow your own talons, these fabulous matte black nails are made for you. Elegant and easy to apply, once they’re in place you’ll have the perfect excuse to do sod all, for fear you’ll break one.